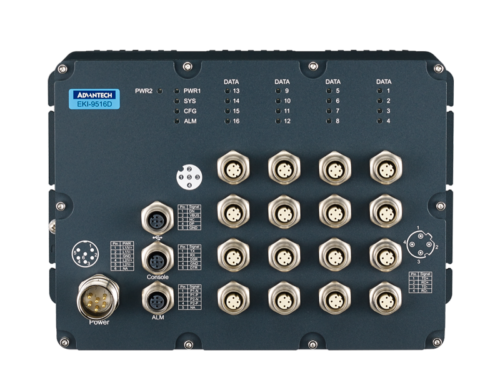 Industrial Ethernet infrastructures demand rugged resilience and seamless security. Whether part of an industrial automation factory network or as the mission critical digital highway for intelligent transportation systems, performance is defined by reliability, ease of deployment and comprehensive management tools. 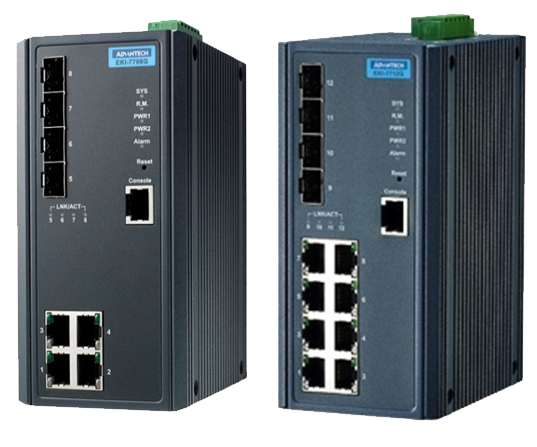 B+B SmartWorx offers a wide range of managed and unmanaged industrial Ethernet switches, including Layer 2, Layer 3, PoE, Class 1/Div 2 and more. In addition to providing all the features you’re already looking for in a fully managed switch, such as support for Telnet, IPv4/IPv6, SNMP v1, V2c and v3, VLAN, IGMP snooping, eWorx helps you save a significant amount of time and money compared to other switches on the market with our embedded IXM™ deployment software. 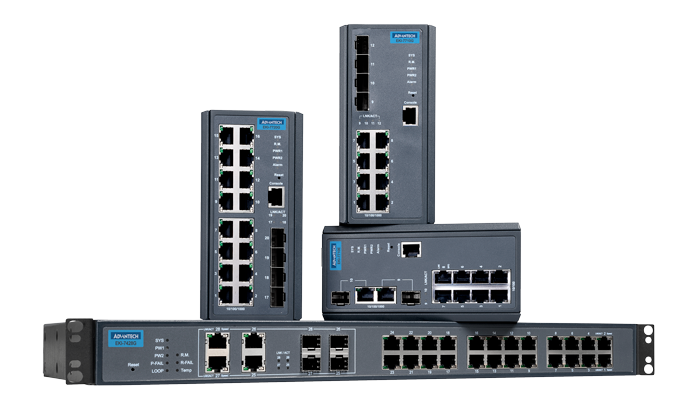 Our unmanaged Ethernet switches come in many shapes and sizes, with many different capabilities. From simple plug-and-play to light managed, all eWorx industrial Ethernet switches include the following benefits: a rugged industrial design, energy-saving capabilities and multiple industry certifications. The goal of intelligent transportation is to create a safer, more efficient, maintainable, accessible transportation environment. Today’s railroad management systems must stand up to difficult environmental conditions, such as heavy vibration, while simultaneously supporting services such as CCTV surveillance, in-car Wi-Fi and public-address systems. B + B SmartWorx’s managed switches are key components that advance the railway passenger experience by ensuring trouble-free connectivity and data communications. 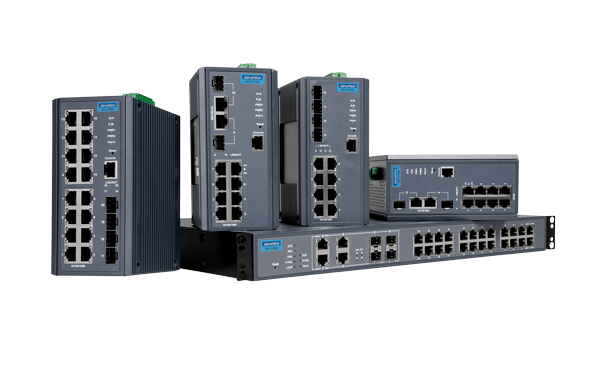 With applications ranging from intelligent transportation and railway to industrial Ethernet at the control level, B+B SmartWorx offers Power over Ethernet (PoE) switches capable of meeting the power consumption requirements of today’s networks, including PoE, PoE+ and PoE++. Our growing selection of PoE switches includes the widest range of power inputs, including 12v, 24v and 48v options, and “X-Ring” technology offers the fastest self-healing Ethernet Redundant Ring with PoE+. Extend Ethernet beyond 100 meters over copper wires or coaxial cable. With features, such as wide temperature, DC power inputs, panel or DIN mounting options, these devices can be applied to a variety of harsh and light duty applications. Some models offer Power over Ethernet (POE) and Power over VDSL (PoVDSL) so end devices, such as IP Cameras, Access Points or IP Phones, can be remotely powered.